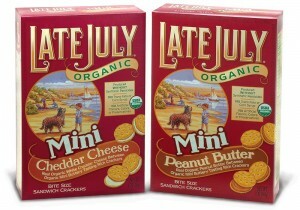 Late July is a great company. Founded by Nicole Bernard Dawes with her dad in 2003, they make a variety of all natural and organic foods. There top 3 reasons for choosing organic is 1. To save the environment 2. Reduce Health Risks and 3. Support Small businesses. 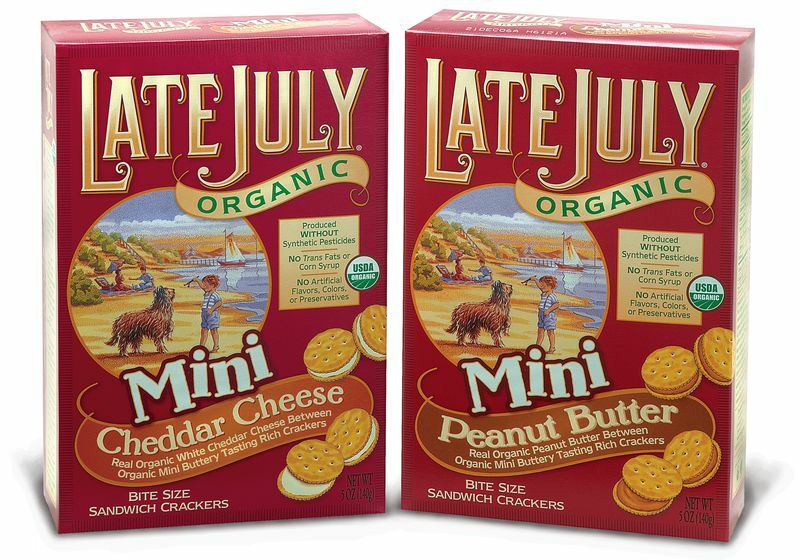 The Late July Organic Mini Endangered Animal Sandwich cookies even donate 10% of their profits to the Jane Goodall Institute, to help those poor animals!! They are also a good source of whole grains and calcium 🙂 Finally, a cookie everyone can feel good about eating!! They come in two flavors, White Chocolate and Milk Chocolate. I got the pleasure of trying both, provided by Late July. Each of the sandwich cookies are ADORABLE. They have a whole bunch of animals on the outside cookie part, including the Leatherback Sea Turtle, Red Wolf, Chimpanzee, Sumatran Rhino, Pygmy Rabbit, Black-Footed Ferret and the Giant Panda. My favorite was the panda! So cute! How could you eat these guys ? White Chocolate- Very delicious. Tastes like a mini oreo-but not as fake tasting or overly sweet. The cream is soft and sweet, with a light vanilla flavor. The chocolate cookie is crisp, and easy to swirl off of the cream. Milk Chocolate– Also deeeeeelicious. Think keebler cookies, but better! The chocolate cream on the inside tastes like a soft, creamy milk chocolate, accompanied by a rich vanilla cookie on the outside. Overall, these sandwich cookies ROCK. 4 stars for sure. 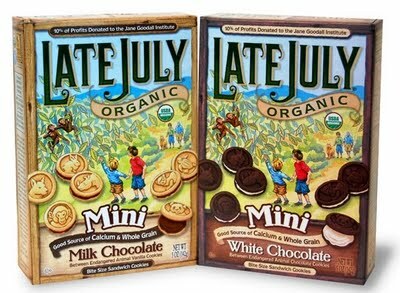 These are great by themselves or with a glass of milk. I spread some natural peanut butter on the white chocolate flavor-HEAVEN!! I would love to try more Late July products. They seem AWESOME!! 10 cookies is 130-140 calories, 6-7 grams of fat, 18-19 carbohydrates, 1 gram of fiber, and 2 grams of protein. You also get 10% calcium needs and 8 grams of whole grain per serving. White Chocolate-Organic whole wheat flour, organic evaporated cane juice, organic powdered evaporated cane juice with organic cornstarch, organic wheat flour, organic oleic sunflower oil, organic palm oil, organic cocoa butter, organic chocolate liquor, organic cocoa processed with alkali, organic brown rice syrup, organic powdered milk, calcium carbonate, organic vanilla extract, natural flavors, sodium bicarbonate, soy lecithin, sea salt. Milk Chocolate-Organic whole wheat flour, organic wheat flour, organic evaporated cane juice, organic powdered evaporated cane juice with organic cornstarch, organic wheat flour, organic palm oil, organic oleic sunflower oil and/or organic oleic safflower oil, organic cocoa butter, organic powdered milk, organic chocolate liquor,organic brown rice syrup, organic cocoa processed with alkali, sodium bicarbonate, calcium carbonate, sea salt, cream of tartar, organic vanilla extract, natural flavors, soy lecithin.